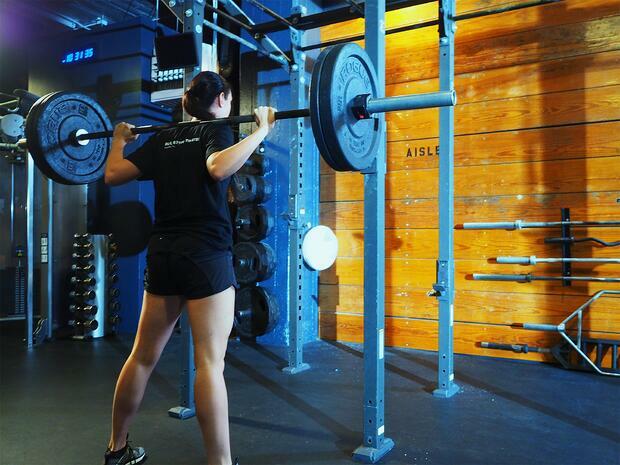 Long before the first game of the season begins, volleyball players should be training in the weight room. During the off-season, athletes should start slow and progressively build their strength and conditioning foundation. The first phase should include exercises that concentrate on increasing range of motion and work multiple planes of the body. After players build a base, they should progress to a strength and power phase where the volume of repetition decreases and weight increases. At this stage, it is important for coaches to find the right balance of weight room workouts and on-court practice sessions. Once the season begins, it’s all about maintenance and taking into account the competition calendar. Maintenance doesn’t mean shutting down completely. It means keeping the athlete sharp, fresh, and ready for every game. Strength coaches look to balance games and implement tapering, recovery, and regeneration sessions so that players reach peak performance come game time. The starting point of any strength and conditioning program begins with an individual assessment and diagnosis. Tailoring programs based on a player’s position, gender, age, experience, and injury history individualizes exercises to build on an athlete’s strengths and obliterate their weaknesses. In volleyball, liberos need to have exceptional serve receiving skills as well as the best passing and defensive skills on the team. In the weight room, liberos should work heavily on quick footwork and reaction time. Alternatively, blockers and hitters will focus on upper-body power, explosive jumps, core strength, and shoulder flexibility. Providing players with an individualized workout program will ensure they are receiving the highest performance training in order to become a better player. Volleyball is a sport dominated by strength and power. Effective programs should focus on strengthening volleyball-specific muscles to ensure that athletes are able to reach their maximum performance potential and lower their risk of injury. Strong leg muscles give players the power they need to elevate jumps for successful serves, sets, spikes, and blocks. On the other hand, upper-body muscles are activated to effectively spike, block, and dig. Core strength is vital for a player’s stability and allows hitters to transition power more efficiently from their lower body to their upper body and arm swing. Lifting in the weight room causes muscle fibers to grow and is the best way for athletes to jump higher and serve more forcefully. Incorporating a full-body strength program will give volleyball players the power they need to succeed at the next level. The game of volleyball consists of short, powerful bursts of activity followed by brief rest periods between points. Aside from practicing specific skills for the court, volleyball athletes need to develop a high level of stamina and endurance in order to remain competitive at a high level. Additionally, being able to track and quickly change directions to keep the ball in play is key to winning points. Incorporating agility and plyometric drills will improve a player’s reaction time, foot speed, and vertical jumps. Putting in the extra effort in the weight room to properly condition players will make a team more dominant on the court. Implementing a dynamic warm-up and cool-down is an important part of preparing athletes for practice and leads to a quicker recovery. Maintaining flexibility and a healthy range of motion increases the ability to move joints and can be beneficial in reducing the risk of injury. A player’s shoulder is a delicate area of the body because it undergoes frequent velocity due to its large range of movements. Properly warming up and cooling down ensures that muscles, especially in the shoulder, are better able to perform and recover quickly. Ultimately taking the time to warm up and cool down will increase flexibility, decrease risk of injury, and improve overall performance. The way athletes treat their bodies before and after workouts on a daily basis can transform their performance from being good to great. Carbohydrates, protein, and healthy fats provide the fuel needed to maintain energy throughout an entire practice or match. Additionally, constant hydration enables an athlete’s body to perform at the highest level. If an athlete is dehydrated, they might feel tired, dizzy, and get muscle cramps. Exercise depletes an athlete’s supply of nutrients, and the purpose of post-workout nutrition is to replenish energy stores, increase muscle size and quality, and repair any damage caused by the workout. Refueling the body the right way is also important to help athletes remain injury-free. It is crucial to educate players on proper nutrition to ensure they are doing everything in their power to perform at the highest level. To learn more about proper athletic nutrition check out this fueling for peak performance article. The right training program can enhance performance, accelerate recovery, and help prevent injury. Volleyball-specific exercises and workouts ensure that players are targeting the most important areas that they need to perform at the highest level. These 6 steps are proven to help coaches build a volleyball-specific training program to maximize player and team performance. For more information about why volleyball players need a strength and conditioning program check out this blog.